"I Burnt My Hair Off"
Every now and then, Jukin Media takes some time to review some of it's most successful videos, and catch up with the owners of those clips. Back in October of 2012, 13-year old Tori Locklear planned to create an instructional video for YouTube that would explain how to properly use a curling iron; unfortunately, the demonstration did not exactly go as planned. While the camera was rolling, the curling iron suddenly overheated and burned off a large chunk of her hair. A shocked and horrified look shot across Tori’s face as she realized what had happened, and in that moment, a smash hit viral video was born. It took Tori several months to post the video, mainly because she got her laptop taken away by her father due to bad grades. Once she got her computer back, she was flipping through old photos and videos and came across the clip. In hindsight, she thought the clip was hilarious, and decided to post It on YouTube to share with friends. Almost immediately after she uploaded it, the video exploded. To date, it has generated 37,580,455 views and more than 60,000 subscribers on her YouTube channel. The clip has since been licensed out and featured on many prominent international outlets, including Dr. Oz, Yahoo, and AOL. Most notably, Tori was a guest on The Ellen DeGeneres Show, where she explained the situation to Ellen and received some hair styling products, as well as a wig in case she ever burned her hair off again. The video became such a hit that Tori was invited to take part in the YouTube Rewind 2013, an original video created by YouTube to the best videos of the year. YouTube stars such as Bethany Mota, Freddie Wong, Hannah Hart, Jenna Marbles, and Ylvis, joined Tori in the video, which has generated over 100 million views. "I Loved Seeing My Video on TV"
Jukin caught up with Tori several years after her video initially went viral to hear about her entire expierence with having a viral video and with Jukin Media. "It was super cool that I was making money from it with all the views that I was getting because I didn't do anything but sit there and watch the views build up," said Tori. While not every viewer can relate to Tori’s specific dilemma, we've all been in potentially embarrassing situations, and it's never easy to know how to handle it. In a world with many YouTube tutorials, it is refreshing to see someone embrace a huge mistake, walk away with a smile, and share it with the world to see. Tori’s hair has fully grown back, and her viral video remains one of the most popular videos on YouTube. Even beyond YouTube, Tori's video continues to be licensed for use by TV shows and ad companies. 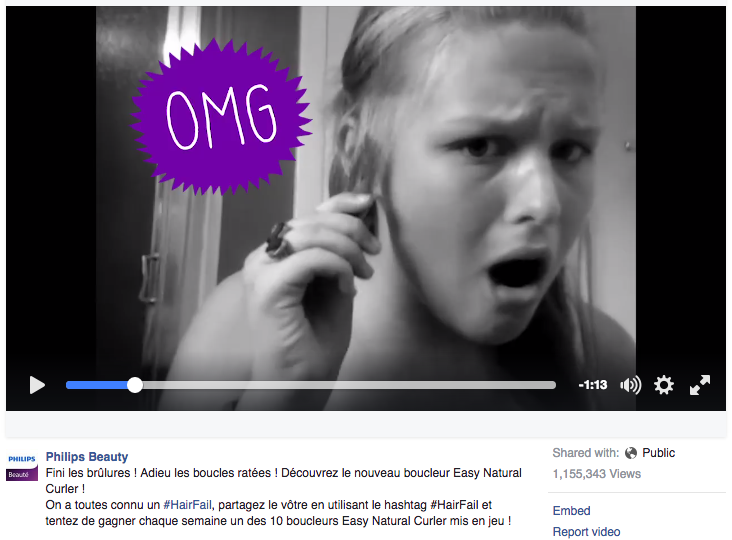 For instance, Philips France licensed Tori's clip for a social media campaign to promote their new hair curler product. Tori's video for the campaign received more than one million views on Facebook. While many people beleive that viral videos have a very short lifespan, "I Burnt My Hair Off" proves that the best user-generated video clips can exist well beyond YouTube and the web, and their lifespan can last years and years into the future. Hear from more Jukin Media video creators by visiting the testimonials section of the Jukin website.